I recently came across the Speedo ON platform and I liked it. I decided to dedicate a few words on it on this blog. 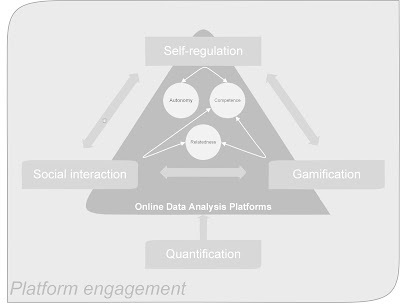 I look at these platforms from the perspective of the theoretical framework I developed in my PhD (see figure). In short, the framework contains the essential elements for online data analysis platforms to be 'engaging', which implies that the user enjoys the platform and finds it worth it to keep using it. This engagement has a strong link to self-determined motivation and implies that for a data analysis platform to be engaging, it should nurture the user's sense of autonomy, competence and relatedness. For a person to be motivated to perform certain behavior, he or she wants to feel in control of the behavior (autonomy), wants to feel competent and wants to do it together with others or have some connection to others performing the same behavior (relatedness). Platforms can address these basic psychological needs through various types of platform features, such as leaderboards or the ability to connect to other athletes. Through these features, a platform has certain 'affordances' to assist in the user's motivation, also termed 'motivational affordances'. In order to address all 3 basic needs (autonomy, competence and relatedness), a platform should have self-regulatory features, social interaction features and gamification. In my PhD, I largely illustrated the model by the example of Strava, a platform that is strongly used by cyclists and runners (and multisports athletes). Strava has elaborate self-regulatory features such as progress monitoring, goal-setting and data analysis and visualisation. In fact, most platforms like Strava (e.g. Garmin Connect, Endomondo, RunKeeper) have these self-regulatory features. Where Strava excels is the social interaction and gamification (see my other blogpost on this: https://jeroenstragier.blogspot.be/2017/10/what-can-we-learn-from-strava.html). These features allow competition, interaction, connecting between athletes and afford the user to have the sense of being part of an 'online sports team', which is nice to have for people who practice sports that are very often performed individually. Now, I was going to talk about Speedo ON. Why do I believe that it has the potential to become the go-to platform for swimmers? First and foremost: it focuses on swimmers. I have not yet seen a platform focusing solely on swimmers. Yes, of course, there's lots of devices that can track in and- outdoor swims and you an upload them to the platforms of these devices (like Garmin Connect or Polar Flow), and you can then sync them on Strava, there's lots of swims on Strava right? Yes. But are these swim from swimmers? Or multisports athletes? I think it is largely the latter. Strava is above all frequented by cyclists, runners and multisports athletes. Speedo ON is the first platform that focuses on swimmers only. Second, upload from various devices: quantification of behavior through wearables is the baseline of my model. Being able to only see your data on the platform that goes with your wearable implies that when you switch brands, you have to use another platform. I know, Strava and others already allow this, I just want to point out that Speedo chose the right path by not wanting to develop their own tracker and keep the data to 'Speedo only platform'. Right now, there's only Garmin and Misfit that can be connected, but I expect others to team up quickly. Third: social interaction. ON affords users to connect to other users (follow and be followed), comment each other's activities. A crucial element from the perspective of a user's need for relatedness. Swimming is a very individual sport and the social interaction on ON can generate a sense of community much appreciated by swimmers. What I don't see is elements of competition on the platform. I don't think that this is crucial, but it has its merits in terms of motivation and engagement, depending on the type of swimmers that will frequent the platform. I realize that a concept of 'segments' like it is used on Strava can be copied to swimming, but I think there are opportunities. It's (to a certain extent) all there. Now, all it needs is critical mass: I'm curious to see how the swimming community reacts. Do they seek these kinds of communities? Is there a need for a platform like this? We'll see I guess. Anyway, I think it's a nice platform and nice move by Speedo. It will generate lots of useful data for them. *Note: I have no connection to Speedo whatsoever :- ). Strava is an online community bringing (recreational) athletes together around their (mostly) running and cycling activities. As I’ve written before, the strength of Strava is their focus on social and gamification features alongside of self-monitoring features (http://www.victoris.be/what-can-we-learn-from-strava/). It has made Strava the most attractive online community for recreational runners and cyclist. Originally, their user base consisted of considerably avid athletes, mostly cyclists with a competitive orientation who are perfectly served by Strava’s segment based leaderboards. The social interaction around their activities perfectly fits within the needs of this niche group. To date, however, their user base is growing and broadening. I see it every day when I get notifications of whom of my friends has joined Strava. They cannot be classified into this original ‘Strava niche population’ of the early days. They are less competition-oriented and care much less about leaderboards in which they’re #3452. They do like to share their activities with their network of friends on Strava, they like to receive kudos and comments and hand them out frequently as well. The core of Strava is posting of activities, logged with e.g. wearable or gps devices. As of today, Strava has launched a new feature, allowing their user to add ‘posts’ to their timeline that are not directly based on activities they performed. They can share pictures of their favorite recipes, ask questions to their network, share links to relevant websites… All with the idea of giving the user a feature that allows them to share these non-activity based post with their network, without having to write gigantic titles for their activities, or put it into a comment under one of these activities. A good ‘relief’ to an existing ‘pain’ it seems. A lot of Strava athletes however, seem worried about this update, judged from their reactions on the Strava Facebook page (https://www.facebook.com/Strava/). Summarizing them in once sentence would go something like ‘don’t become another Facebook or Instagram’. Yet, keeping the types of posts that now go on to these social networks on Strava, is what inspired this new feature. I think it’s a logical step for Strava to introduce this kind of feature (apart from the fact that the former Instagram vice-president is now amongst their ranks), especially in the light of their broadening user base. But I also understand that the ‘original’ Strava user is scared of the thought of having his/her timeline filled with redundant posts ('how long until pictures of peoples dogs come up on my timeline’). The question is whether Strava wants to stick exclusively with this original user base? Is there much growth left among this group? The launch of this new feature should be framed in the light of this question I suppose. As humans, we all strive to nurture our basic needs of competence, autonomy and relatedness through our behavior. We want to feel a sense of accomplishment through what we do, we want to be in control of it and equally important: we want to experience it together with others. Exercising is a good example of behavior through which we want to nurture these needs. To keep ourselves motivated, we set goals, e.g. enrolling in a 5K running event 6 weeks from now, we team up with others for that extra bit of peer pressure that hopefully will prevent us from backing out… But sometimes, others back out before us… and then we follow… goals are not completed and our running shoes will soon collect a fresh new layer of dust. Technology to the rescue? Maybe! Everybody knows somebody who owns a fitness tracker or an even more advanced GPS-enabled sports watch. They are developed to collect large amounts of data on our daily physical activity and/or exercise behavior. They count our steps, tell us how many calories we’ve burned, how far and for how long we’ve been running and many more. These data can be consulted on an online data analysis platform. Most of these platforms do a great job on telling us all about how well (or bad?) we are doing and how we are progressing towards achieving our physical activity goals. Feedback on our behavior, that’s the key to keep us motivated, it has been proven so many times… at least in the short term. It appears that we abandon our fitness trackers almost as quickly as we’ve adopted them. How can this be? They give us this precious information on how well we’re doing and help us to achieve our self-set goals, fulfilling our much desired need for competence and autonomy… but we still can’t keep it up? Wait, what was that third thing we needed? Right, relatedness! What if we could share our achievements with others online? I´m sure you already heard about Strava?! It’s a great example of an online fitness community that brings it all together, with success. On Strava, you can do everything we mentioned before, like uploading your running and cycling activities, set goals, plan your training, etc. But in addition to that, Strava successfully created a community around all of these data. Besides offering us features to ‘self-regulate’ our exercise behavior, Strava implemented two other key elements, which in our opinion, are crucial in its success: social interaction and gamification. Social interaction features allow the users to communicate around their activities and most importantly: support each other. You can endorse your friends by e.g. giving ‘kudos’ or comments to their activity. Social support has been designated as a crucial factor for keeping up healthy behavior. When we don’t receive it offline, we can now get it online! Hurray for social interaction features, designed to fuel our sense of competence and relatedness! What about gamification? ‘Isn’t that like giving virtual badges and stuff? That’s interesting… for a little while…’ Yes and no. Gamification on Strava is largely social. You can still get trophies for besting your 10k time, but through so-called leaderboards and other comparison tools, you can also see how you’re doing compared to people you know (or don’t know). ‘Interesting’, you say, ‘but I’m sure I’ve seen this on many other platforms?!’. Right you are, but interestingly, Strava has by far exceeded their competition in creating a social and gamified platform. Let me show you a graph about this, based on data we collected from 332 runners who use platforms such as RunKeeper, Endomondo, Strava and Garmin connect. We asked them to indicate (on a seven-point scale) how often they use self-regulatory features (like planning a workout, setting a goal and monitor their exercise behaviour), social features (‘liking’ and commenting activities, connecting to other runners) and gamification features (collecting badges and comparing their achievements on leaderboards). 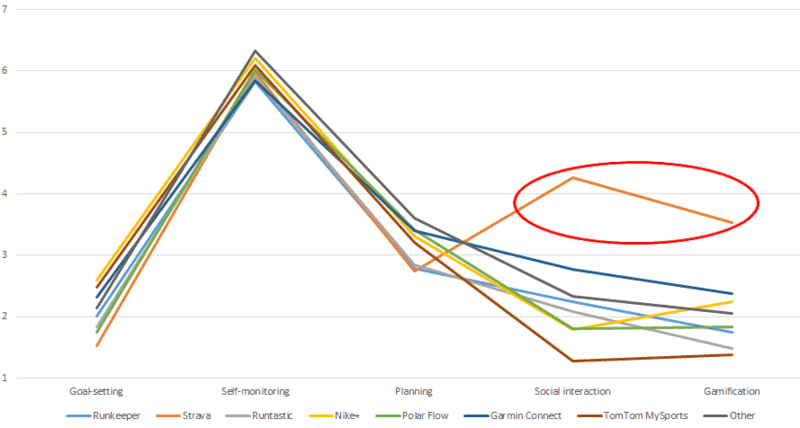 While it is clear from the graph that these platform are primarily used to self-monitor exercise behavior (that’s what they’re made for), it is also pretty clear that social interaction and gamification features are a lot more intensively used on Strava compared to other platforms. ‘Why is that?’, you may be thinking. First of all: open profiles by default, which makes it fairly easy to follow other athletes on Strava. You can close your profile, but what is there to hide? Don’t you want to show off with your new KOM (King-of-the-Mountain)? Various other platforms expect you to file a formal ‘friend request’ to see each other’s activities in your feed. Strava’s Twitter-like approach is just more appealing and social. Second, granted, on average, Strava users are more competitive and therefore more susceptible to social interaction, comparison and gamification. This will have a significant impact on the use of gamification and social interaction features, for sure. Nevertheless, to some extent, everybody seeks recognition for their achievements. Finishing your first 5K race and having no one to congratulate you, or share your sense of accomplishment with, is just very unfulfilling. Lastly, while other platforms are increasingly offering social interaction features as well, Strava has done a particularly great job on integrating their social gamification features such as leaderboards and segments. The dynamics created by these features are fueling the interaction in the community. While Strava is indeed for a large part populated by intrinsically motivated athletes, there are things we can learn from their successful community approach and translate these ‘good practices’ to those people who are less eager to jump on a bicycle. If we want to motivate people to move more, sit less, eat healthier,… we should not limit ourselves to designing interventions and platforms that are too strictly focused on quantifying our behavior into numbers and then use these numbers for goal setting purposes (people constantly evaluating themselves in an isolated environment). It works, no doubt, but also in the longer term? If we want to achieve long-term behavior change, shouldn’t we enable people to achieve this is a more connected environment? The example of Strava shows that integrating the right features can result in a social and engaging environment, which may lead to a more sustainable behavior change.